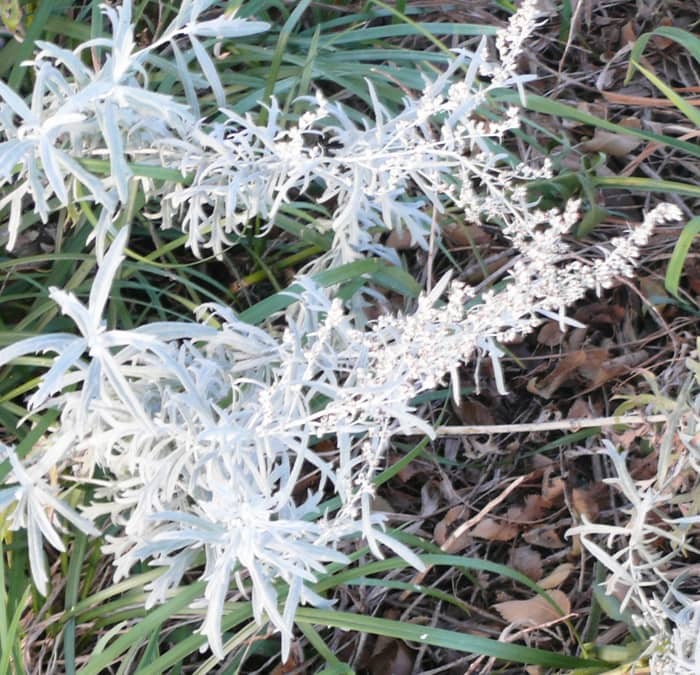 The right Artemisia, with its silver foliage and the ability to look good in drought, can be an asset to your flower gardens or borders no matter how large or small. 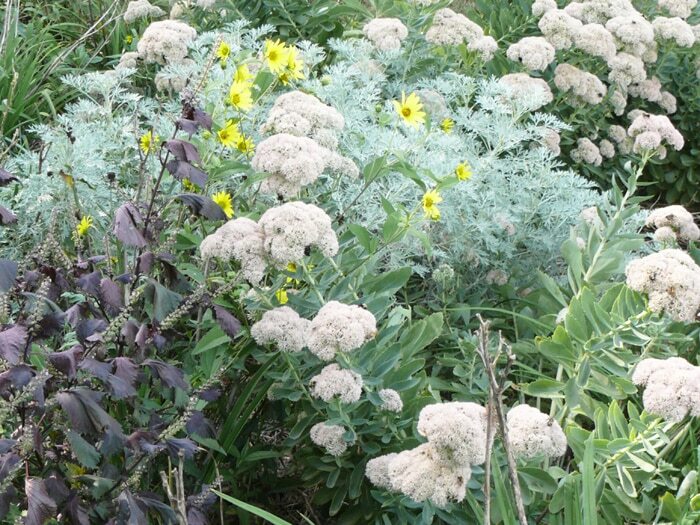 These ornamentals with their beautiful grayish/silver foliage can tie together plants of varying colors. They can be used to soften bright red and oranges. They make a spectacular statement when blended with purple or green foliage and/or colorful blooms of pink, purples, lavenders, yellows and fuchsias. The genus, Artemisia includes hundreds of species including sagebrush, popularized in movie westerns. Tarragon, one of the four “fines herbes” of French cooking is an Artemisia as well. 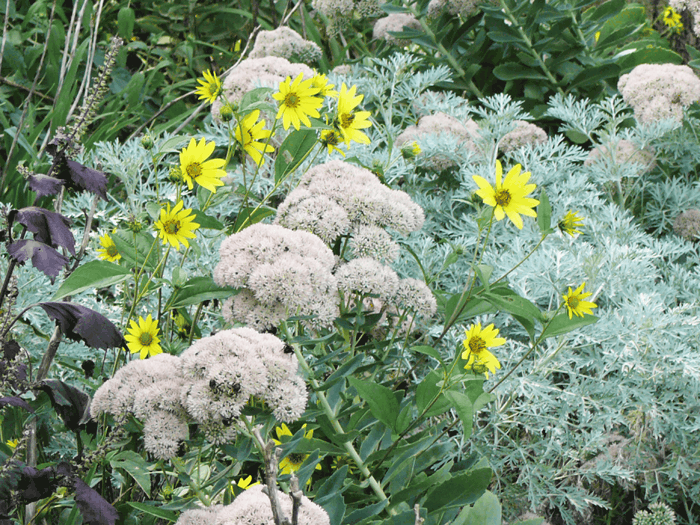 But for the purposes of your flower gardens I would recommend 3 species in particular. A genus name with the X and a single quoted phrase as Artemisia X ‘Powis Castle’ indicates a hybrid species. Thus, you read it: “artemisia, the hybrid species ‘Powis Castle’ “. Powis Castle is the result of crossing two species of Artemisia. Thus, it occurs only in cultivation and can only be propogated by cuttings. Powis Castle can be considered a shrub. 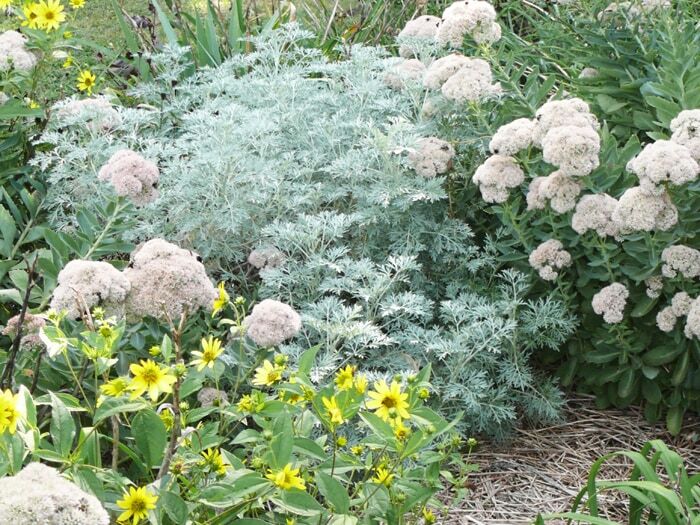 It is my favorite Artemisia and grows in a dense mound up to 3 feet tall and 3 to 6 feet in diameter. The foliage is like silver lacework! And it is one of the hardiest, strongest and most beautiful of the Artemisias and is considered by many (myself included) to be one of the finest plants in cultivation. Once you buy a plant, you can take cuttings in March and October and start as many others as you want. Although it’s a pretty tough plant, I’ve found that you can loose it unexpectedly. Because of this, I recommend always having some new ones started. And that doesn’t have to be a lot of work or a “job”. Just take numerous cuttings from the tips (about 4 or 5 inches long) on a day when you are looking around or taking a walk. (You’ll want to do this when the soil is nice and moist.) Then plant the cuttings as you continue your walk. If you later find you’ve put them in the wrong place, the new plants will be easy to transplant to just the right spot the following spring or fall. Some of your cuttings will root and some won’t. You’ll find that some will like where they’ve been placed better than others. If you see that one doesn’t want to “take off” — just give it another year to make sure. If you follow my suggestion, you’ll have plenty of them started so it won’t hurt for you to experiment. If you want more details on taking cutting and starting, see my post on starting sedum. All 3 Artemesias can be started the same as sedums. It will grow in part shade, but gets bigger when it has full sun. It is said to usually do well in zones 6 to 8. It likes well drained soil. It keeps its silver foliage all winter although it will look somewhat shabby and drooped in the cold of winter. This is a perennial artemisia that originated in Japan. It forms a smaller mound (6 to 18 inches tall with a spread of 12 to 24 inches) than Powis Castle Artemisia, but its foliage is similar. As with most Artemisia, it’s easy to grow. It enjoys relatively infertile soil. Needs little water, but does need good drainage. It is usually recommended for zones 5 to 9. It loves sun, but is not as heat resistant as “Powis Castle”. It has a tendency to split apart at the center of the crown in mid-Summer if conditions are not just right, but in spite of that I think its worth a try. I’ve grown it in years that it did not split and it was wonderful. To get more —— I take numerous tip cuttings in March and/or October. I don’t go to a lot of trouble—–just the stick the cuttings in at various places. Some make it. Some don’t. But I always have new plants in process. It remains silvery through fall and dyes back quickly to the crown with the first frosts. Next year’s spring will start its growth again. The leaves and stems of this native (to western US) species are more slender than most. It is an upright perennial that typically forms a spreading clump of non-woody stems about 36 inches tall. The clumps will spread outward 2 or 3 feet by rhizomes under the ground. If it grows out of bounds (which it will in most years) it’s easy to pull out. It grows easily in poor and/or dry soil in full sun. Good drainage is essential to prevent root rot. When foliage declines and stems flop in hot and humid weather, just cut it back. It will revitalize itself. Cutting back stems in late spring to reduce mature plant height will also help. Want more? — you can take cuttings in the spring, but I find it much easier to just pull out some stems and transplant. Many times I’ll take rhizomes out of the surrounding area and transplant them. One day after I have long forgotten about them, there will be more artemisia. Suggestion: Try Silver King with roses and/or white Asiactic lillies. Of the hundreds of species of Artemisia, only about 44 are edible. Many are deadly if ingested. Unless you have the proper training to know which is which ———just enjoy looking at them in your borders. The more I searched for information on the Scientific Names for these Artemisias, the more conflicting information I found. There was so much, it really got confusing. Nonetheless, I think I have given you enough information to find each plant.